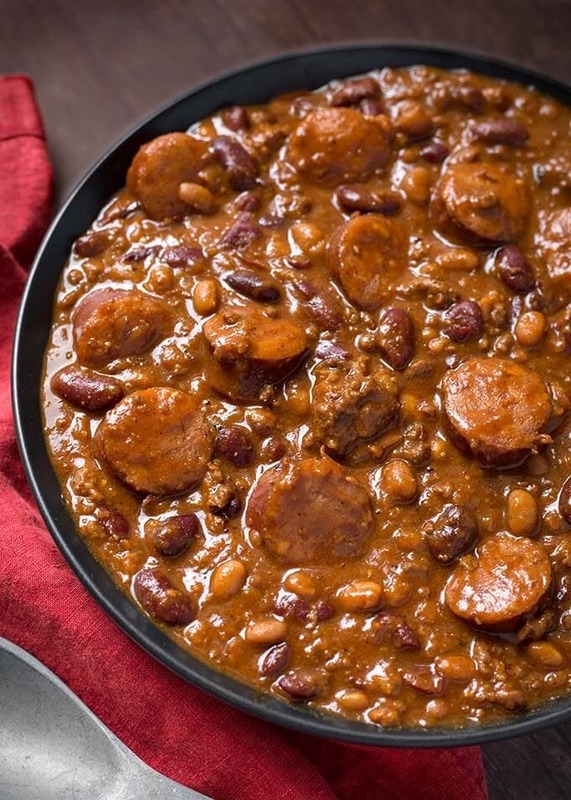 Instant Pot Cowboy Beans are baked beans that have three kinds of meat in them. The flavor is rich and delicious, and a little less sweet than my regular baked beans. These pressure cooker Cowboy beans are hearty enough to be your main dish, or a really amped up side dish. Take them to your next potluck or barbecue and watch them disappear! In our family I am known for my baked beans. At least when it comes to our get togethers. The fam gets cranky if I don’t bring them. They are very delicious, and have lots of ingredients, and are time intensive, so I only make them a couple times a year. 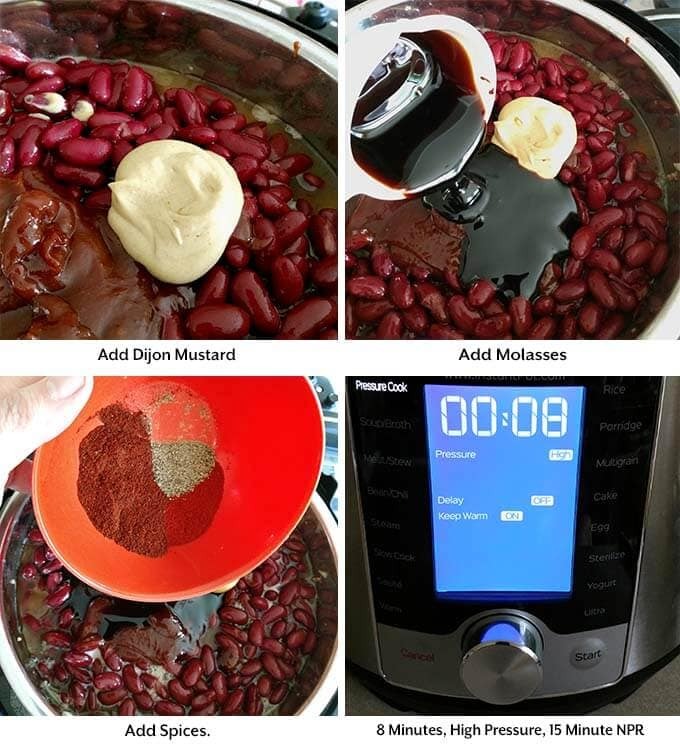 The Instant Pot® has changed that as it’s much faster to cook the beans, and is a one-pot recipe. 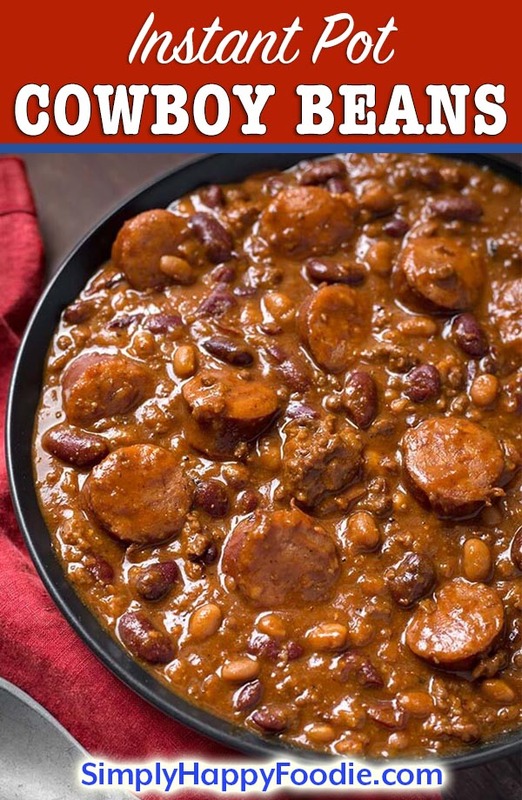 This year I’m changing it up and bringing Instant Pot Cowboy Beans! Yee Haw! 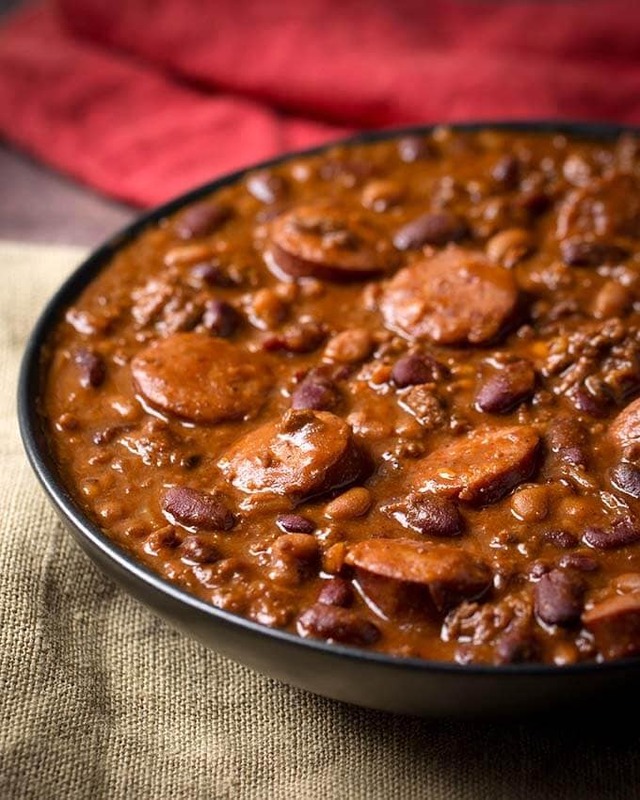 These are baked beans that are heartier and meatier, with ground beef, bacon, and kielbasa smoked sausage. It sounds like a lot, and it is, but dang me they are good! When you get all of the ingredients in the pot, let the contents heat up before closing the lid and turning off the Sauté setting. This will help the pot come to pressure faster, and help eliminate the BURN warning potential from such a thick mixture. If the timer starts to count down, and the pin on the lid has not popped up, then you can open the lid and give the beans a little stir, just to scrape the bottom of the pot and make sure nothing is stuck on the bottom. Then reset the timer. 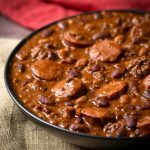 Delicious Instant Pot Cowboy Beans! A super easy recipe with awesome results! Instant Pot Cowboy Beans are super flavorful and hearty enough to be a main dish. Bring these to your next potluck or barbecue! First, get everything ready. Meat & veggies chopped, spices ready, garlic pressed or minced, measuring cups, etc. This helps the process go smoothly! Turn on the pot's Sauté setting and add the ground beef, bacon, and onion. Cook until meat is no longer pink (you shouldn't have to drain it unless you use a fattier meat. Leave some of the fat in there..
Add the garlic and stir. Let cook for a minute. Add the water and kielbasa. Add the remaining ingredients in order (except brown sugar), and do not stir, just push them down into the mixture to cover them. Press the Pressure Cook/Manual button or dial, and then the + or - button or dial to select 8 minutes. Watch the pot until it comes to pressure. This is a pretty thick mixture, so you want to make sure you don't get the burn message. If you do, remove the lid if the pin is still down (otherwise release any pressure first) and get your wood spoon down in there and scrape the bottom. Add another 1/4 cup of water if it looks too thick, close the lid, and reset. When the cook time is finished, turn the pot off (so it doesn't go to warming) and let it sit undisturbed for 15 minutes (Natural Release). Then release the remaining pressure in short bursts, until you are sure no sauce will be spewing out with the steam. When the pin in the lid drops down, open and carefully mix up the beans. Stir in the brown sugar. 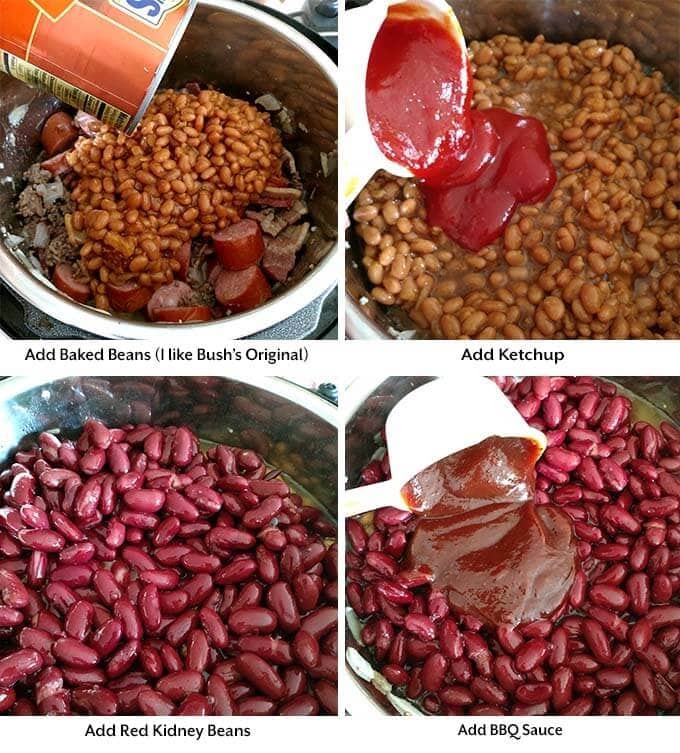 *If you are using an 8 quart pot, use 2 cans of kidney beans. Bump the amount of water up to 3/4 cup. These are hands down the best cowboy beans I have ever eaten! Wow! I was worried they would be too thick for my pot to come to pressure, but it did! My husband loved these too, and took them for lunch, and then wanted them again for dinner! Thank you for sharing this recipe! That’s great, Ashley. I’m so glad you liked these. Thank you for your review! Can this recipe be cut in half, or would it burn? You can cut it in half just fine. If it looks too thick, just add another 1/4 cup of water. Do you know what the calories and serving amount for one, is for this recipe. Should the bacon be cooked before adding to the instant pot or cooked in the pot? 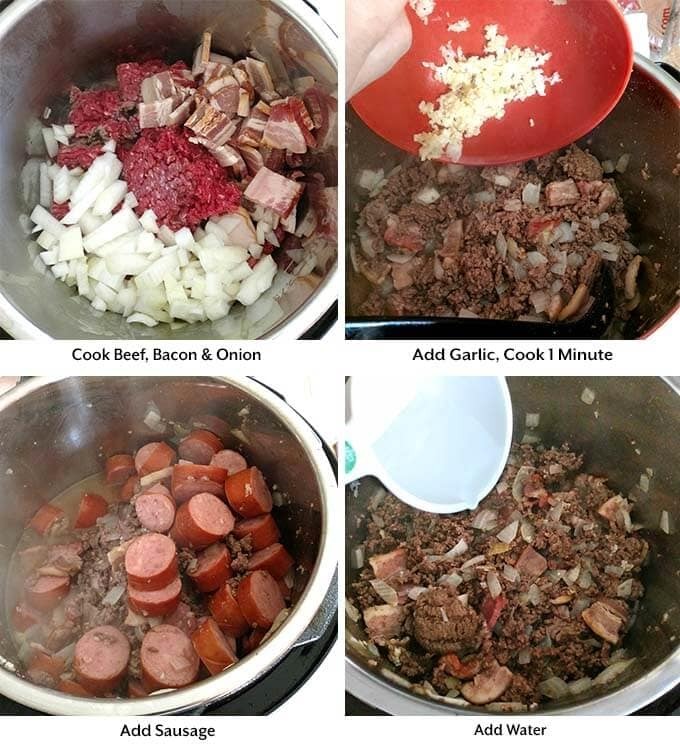 The bacon gets cooked with the ground beef. See step 2 of the instructions. These turned out amazing, I didn’t have sausage last time and I used grilled hotdogs. Tastes even better the next day. Hubby requests this on the regular. If I halve this recipe and am using an 8qt, do I still add the extra liquid? Only if it won’t come to pressure and you get the burn message. Is there a particular BBQ sauce you prefer? I like the hickory smoke flavored kind.